When a new manager joins a new team, it is of vital importance that he quickly builds a team and establishes in his head his best starting eleven. The new manager will assess his squad and identify who his best players are. Any person looking in at Everton Football Club can instantly tell you their best, most important player is… Leighton Baines. With all the commotion of transfer deadline day and last-minute deals coming in to the club such as Barry, McCarthy and Lukaku, and players leaving like Marouane Fellaini and Victor Anichebe, one of the most important, if not the most important business Everton did throughout the whole summer, was making sure that Leighton Baines was still an Everton player come that eleven o’clock deadline. Since Baines joined Everton from Wigan in 2007 and taking over from Nuno Valente at left back, Baines has moved from a regular in the starting eleven to one of the first names on the team sheet, and arguably Everton’s most important player anywhere on the pitch. If Baines had left this summer, it would have been a major headache for new manager Roberto Martinez. Not only would he have been forced to either sign a new left back, or to play Baines’ understudy Bryan Oviedo, the club would have faced a major backlash from the Everton fans over selling one of their favourite players to fellow Premier League club Manchester United. That would be the last thing a new manager needs just as he is trying to settle into a new club, especially one as big as Everton. With the controversy over the new club badge, the sale of Baines would have put major pressure on owner Bill Kenwright to spend big in the remaining days of the window, and if the Everton fans had not seen new faces, you can bet there would have been more protests for Kenwright’s head. Fortunately for Everton fans, Kenwright and Martinez stayed firm over their promise not to sell Leighton Baines to Manchester United, ensuring that Everton would have a successful transfer window. With their new additions coming in and keeping hold of their most important players, it has been a strong window, a necessity for any club looking to grow and develop. Many outsiders may not understand why keeping Baines was so important, why he is so valuable to any Everton side? His stats speak for themselves. The chart above compares two of the Premier League’s best left backs, Leighton Baines and Patrice Evra, looking in detail at their passing and crossing statistics from last season. These statistics clearly show how much of an influence Baines is going forward, as well as in defence. His performances over the recent years have caused him to break out into the England national team and contest Ashley Cole for his left back spot, a spot that had been uncontested for many years. It is only a matter of time before Roy Hodgson will see that Baines has clearly surpassed what Cole can bring to the team, as Baines creates more chances, is a stronger defender and is also a set-piece specialist, another dynamic element to his game. 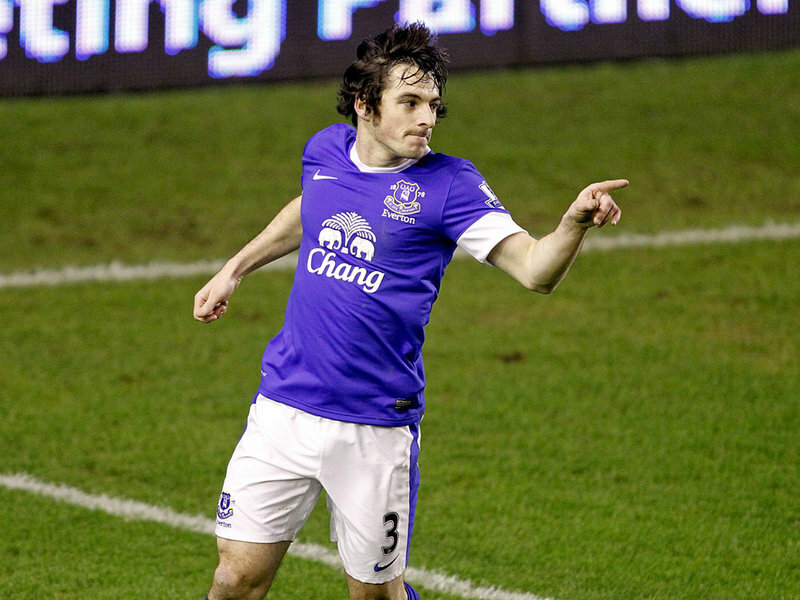 When it comes to Everton and the Premier League, Baines is already being recognised. He has been consistently chosen by peers and managers as the best left back in the Premier League and earning a place in the team of the season for the past two years. He has won numerous club awards such as player of the year and player’s player of the year, highlighting how vital he is to Everton football club. His left side partnership with Steven Pienaar has become feared among other Premier League defences. Baines has also created a cross field partnership with Seamus Coleman at right back, with both playing as very attack minded wing backs, adding a whole other element to Everton’s play and style, something that has created a vast number of chances throughout last season. Alongside his defensive colleague Phil Jagielka, he has broken into the England setup and with Ross Barkley now emerging as an England international; Everton’s investment in playing local home-grown players is paying dividends (Baines and Barkley were both born in Liverpool, Phil Jagielka in Manchester). So as you can see, if Leighton Baines had left Goodison Park in the transfer window, he would be taking a lot away from Everton Football Club, mainly his ability to create many chances, his dead ball expertise, his leadership on the field and his interaction with the fans, who would have been distraught to see their favourite left back go. This is why keeping the irreplaceable Leighton Baines is absolutely the best bit of business that Mr Martinez and Mr Kenwright did this summer.